The crucial service is suffering from chronic driver turnover due to low wages and a lack of affordable health benefits, and now workers are considering a strike. A paratransit driver helps a rider off the bus in downtown Oakland. It’s one of the most vital public services in the East Bay: the paratransit bus system, which carries about 60,700 passengers per month to and from doctor’s appointments, rehab centers, senior housing, and other destinations in Alameda and Contra Costa counties. But the service provider, East Bay Paratransit, is suffering from a driver shortage and struggling to keep its buses running on time. The result, according to passengers, is that they’re frequently late for medical appointments — and sometimes stranded for hours. Drivers say the problem has gotten worse during the last couple years. Now, they’re considering going on strike. The root of the problem is low pay, unaffordable employer-provided health insurance plans, and grueling working conditions, all which leads many drivers to quit. Berkeley resident Craig West is a frequent Paratransit rider. He said he often notices that drivers are fatigued from working long hours. “They’re disrespected, the dispatchers don’t treat them very well, they don’t get bathroom breaks, and they have no time for lunch or dinner,” West said. 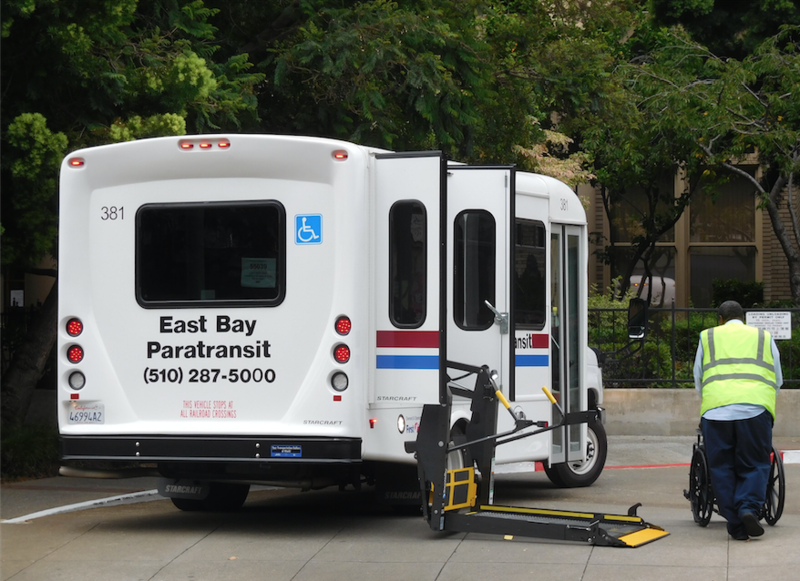 East Bay Paratransit is a service that’s mandated by the federal Americans with Disabilities Act, but the feds don’t cover the entire cost. It’s up to the regional agencies BART and AC Transit to plan and pay for it, using a mix of local, state, and federal funds, along with passenger fares. In 2013, BART and AC Transit signed a five-year, $430 million agreement with Transdev, a multinational corporation headquartered in France, to manage the system as a broker. Transdev then hired several bus companies — MV Transportation, First Transit, and A-Paratransit — to actually provide the vehicles, drivers, and most of the dispatchers. On average, there are 2,575 trips every week, carrying 16,830 passengers who have signed up for the service, according to data provided to the Express by BART. But compensation figures described in a recent AC Transit staff report reveal that East Bay Paratransit drivers are some of the lowest paid operators of any public or private transportation service in the Bay Area. The average starting wage for drivers at the three companies under Transdev’s supervision is $14.41 per hour, whereas it’s $16.05 for peer companies that provide paratransit services in other Bay Area counties such as San Francisco and Santa Clara. Most East Bay Paratransit drivers top out at $19.90 per hour, but other regional services pay $21.85. The lack of affordable health care makes matters even worse. According to AC Transit, East Bay Paratransit drivers pay thousands more per year for health care than operators who work for other providers. The cost is so high that many drivers simply go without coverage. “It is troublesome to see that operators for MV have to pay $600 per person for their health coverage,” AC Transit Director Elsa Ortiz said at a June 28 board meeting. “That is quite a steep amount when you’re making 15-22 per hour. The Express interviewed 14 drivers who work for First Transit, one of the subcontractors under Transdev’s supervision. They all requested not to be named for fear of being retaliated against by Transdev and First Transit. Only two drivers said they currently have health coverage through First Transit. The company plan is too expensive, they said. One, who has worked eight years for the paratransit system, said he can’t afford the $700 per month it would cost to purchase medical insurance First Transit offers for himself and his wife. He said his work day begins around 4 a.m. in San Joaquin County, where he lives. He makes the hour-long commute to Oakland, then often works until after 3 p.m. Ten hour shifts are the norm for many drivers, he said. Factoring in commutes, there’s seldom time to spend with their families at the end of the day. Another driver who lives in Oakland said he makes $16 per hour. His landlord recently raised his rent. He has a car loan and other bills to pay each month. He can’t afford health coverage, so he goes without it, even though he was diagnosed years ago with diabetes. “I also don’t have any retirement savings,” he added. Drivers’ hours are often extended because dispatchers with Transdev, or with the three subcontractor bus companies, give them “add-ons” — passengers who need to be picked up, but who weren’t included in the driver’s original daily schedule at the beginning of their shift. Add-ons — also called “no-strands” by the dispatchers— throw operators’ schedules off and force them to travel long distances to make pick-ups and drop-offs. This causes other passengers to have to wait longer, as well. Bragdon said that, over the years, scheduling problems have only gotten worse with the system. As the problems get worse, more drivers walk off the job, creating a spiral. “We only stay with this job because we care about our passengers,” he said about those remaining, who have been on the job for more than a couple of years. Often, new drivers quit soon after they’re trained and hired and go work for another transit agency, or for the companies that operate buses for tech companies, which pay more and operate during less-demanding hours. One driver who works for First Transit told the Express that there were fifteen new drivers hired alongside him three years ago. Of the fifteen, he’s the only who stayed on the job. Most of them left within six months to a year after, and nobody lasted longer than two years. West said he’s been stranded multiple times because of the driver shortage. For example, earlier this year, he scheduled a trip from Berkeley to his bank in San Francisco’s Financial District. From there, he was supposed to be taken back to Berkeley for a doctor’s appointment, and then to his home. He set the trip up more than 24 hours in advance and paid the fare. But after he was dropped off in San Francisco, the bus that was supposed to pick him up again never showed. He was stranded for more than three hours in the bank lobby. As a result, he missed his doctor appointment and had to pay a late fee. BART and AC Transit spokespersons both told the Express that they’re currently working with Transdev to try to resolve the system’s problems. But the agencies have no direct authority over the three bus companies that employ the drivers; they work under subcontract with Transdev. Jay Jeter, Transdev’s general manager for East Bay Paratransit, said his company has no authority to increase driver pay or benefits. Those are negotiated between the drivers’ unions and the three subcontracting bus companies. But he has urged the companies to do more to address the driver shortage. In a June 26 letter to the three subcontractors, Jeter wrote that they have a contractual obligation to “have a program of recruitment and compensation which leads to the retention of qualified employees.” He noted that, in recent months, the bus companies have had up to fifteen operators missing each day because of the labor shortage. Jeter wrote that Transdev would be monitoring turnover and absenteeism rates to “ensure labor harmony.” Transdev also required the three companies to provide a written confirmation that they are complying with all federal, state, and local labor and wage laws. Drivers claim that the three companies have skirted legal requirements. For example, they frequently miss their breaks and lunches. Several drivers also alleged that they have been made to lie on California Highway Patrol logs, which document the number of hours an operator spends behind the wheel, and are filled out to ensure that drivers operate buses safely and without fatigue. Jeter said he wasn’t aware of any of any “criminal wrongdoing,” and that CHP inspects every service provider each year. “They’ve all passed CHP inspections annually since I’ve known this contract,” he said. Drivers from two of the three bus companies that work under Transdev’s supervision — First Transit and MV Transportation — are represented by the Teamsters union. And drivers with A-Paratransit are represented by the Amalgamated Transit Union. Contracts between the unions and the companies expired last month. Drivers said in interviews that they haven’t made progress yet on higher wages or better health care. Phone messages left with the three bus companies weren’t returned. But in responses to Jeter’s June 26 letter, the general managers of all three companies said they’re trying to provide better pay and benefits. “First Transit always works in conjunction with our labor representative to negotiate a competitive wage and benefits package that is advantageous to labor harmony that is essential to successful driver recruitment and retention,” wrote Broyce Batchan, the general manager of First Transit. Frustrated, drivers like Bragdon say they endure because they love the work they do.